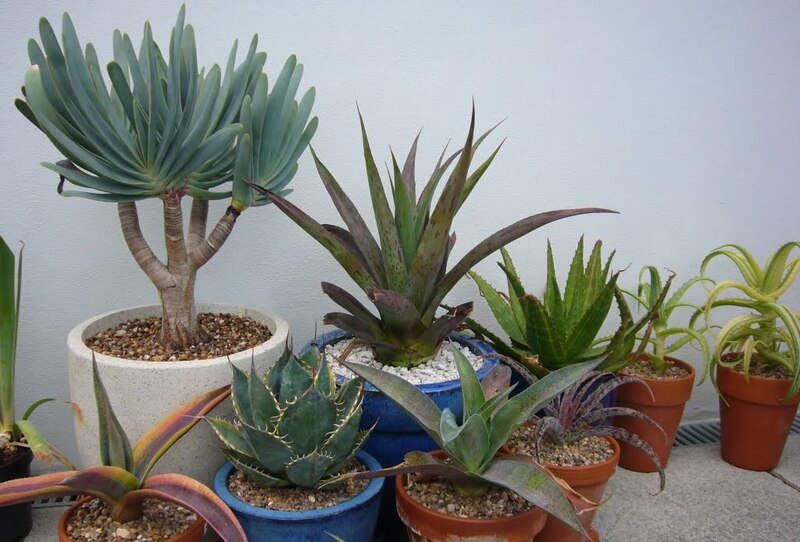 There has not been a lot of plant talk here lately. The works on the house dominates things at the moment, plus I have been in my winter disinterested period. Over the last couple of weeks things have started to change, and the greenhouse has been calling. Today was a rare sunny day. After months of rain and storms, it was a change to be able to go outside and look at things in the sun. So an ideal opportunity to do a quick check up on how the plants are coping with this strange winter. The main cold frame was a sign of things to come, the plants currently look great, I can't remember seeing them look so undamaged at this point in Feb. The biggest problem seems to be that with the lack of cold, the snails are not totally gone and there is the odd bit of snail damage. 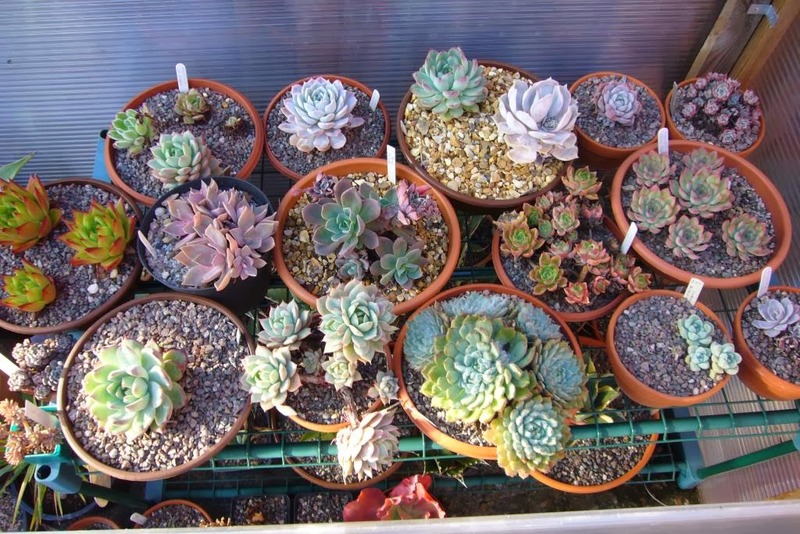 It is always good to see the echeverias doing so well. Normally they suffer a fair amount of damage and take the first part of summer to recover. Hopefully this year they can start from a better point. Then it was time to try and get to the greenhouse. The builders have totally blocked the front, so I had to squeeze through the side and then try and prize the door open. With a little re-arranging I managed to open it just enough to get inside and again was thrilled to see everything looking very healthy. I had left a few plants in here by accident and the fact that so far they show no damage is a bit of luck. While it has been a stormy, wet winter, we have had almost no cold at all so far. The forecasts show no let up in the storms, but also no real drop in the temperatures. I very much doubt we will get away without any real cold; one of the things that sets the UK apart from the rest of Europe and other parts of the world is the degree to which winter can go on. Hopefully the last part of the winter will be as mild as the rest, it will make a nice change. Hi! 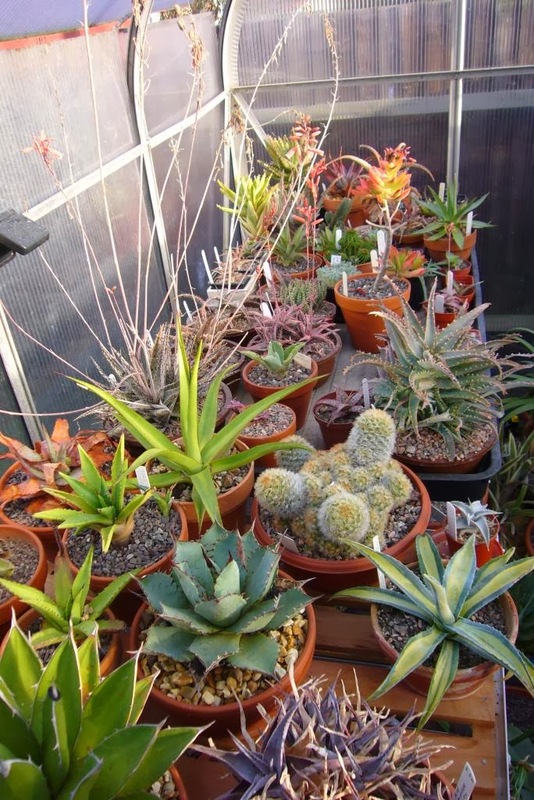 Things look pretty good in the greenhouse. And I can't wait to see how your remodel is going. That is very exciting! Thank you, we have had no winter to speak of which really helped. 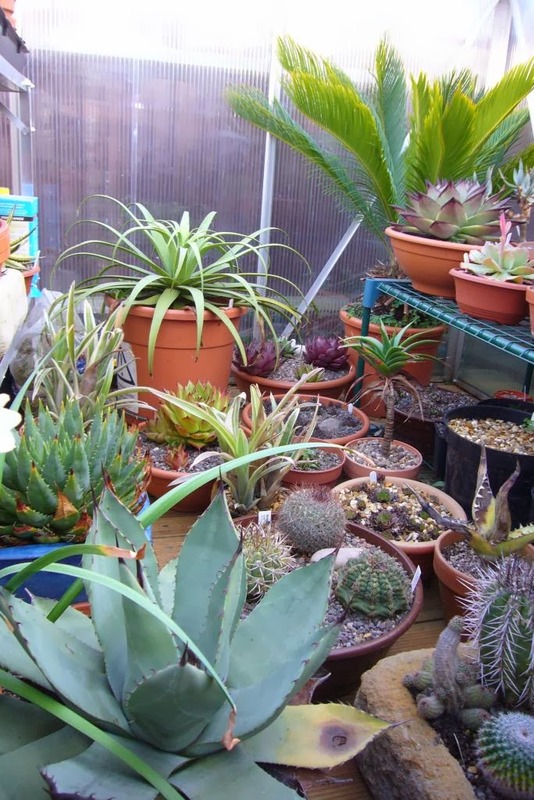 I just discovered your blog, and I have to say I could stare at your plants all day! 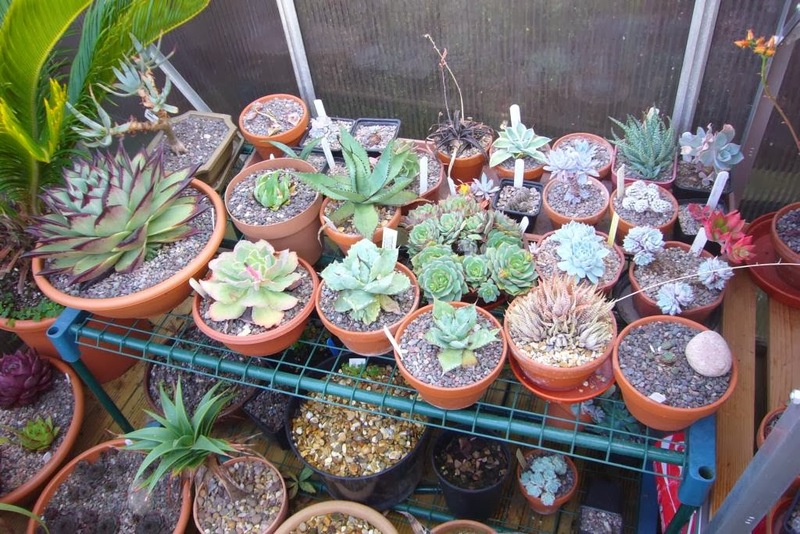 I started a succulent collection about 6 months ago, and this winter everything has been inside. However, I've been running out of room on my south facing windowsills, which are the only ones that get enough light to keep plants alive. 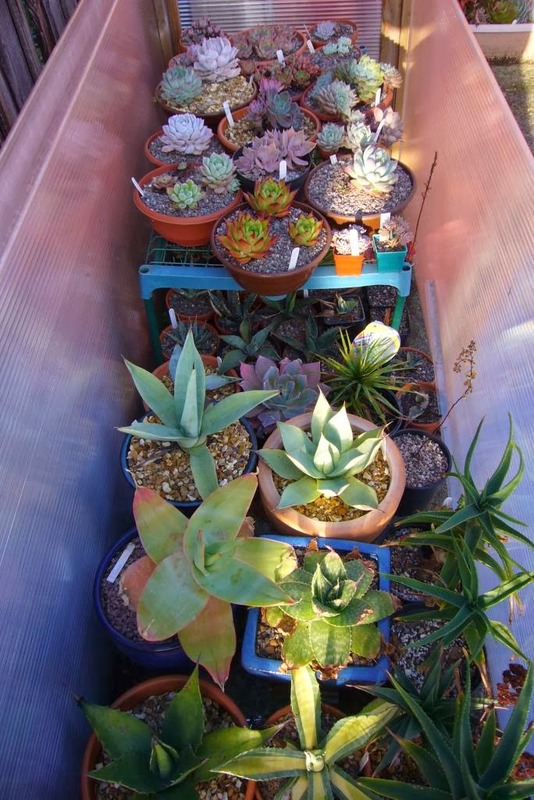 I had never seen a cold frame until I visited your blog, but it is a fantastic idea! Would you mind telling me how you constructed yours? I think having one would be a lifesaver! I tend to keep them really simple, 4 vertical struts of wood, with sheeting attached. Use use the twin wall polycarb as it gives a bit of insulation, but you could use any clear sheeting, I like to have a lid that I can easily remove on sunny days to air it as lack of ventilation can be an issue.